How reliable is the Government’s dietary advice? From public hospital menus to school food programs, Australia’s dietary guidelines inform health policy. Maryanne Demasi reports on the flaws and the conflicts of interest in our dietary guidelines, and the influence of food corporations. 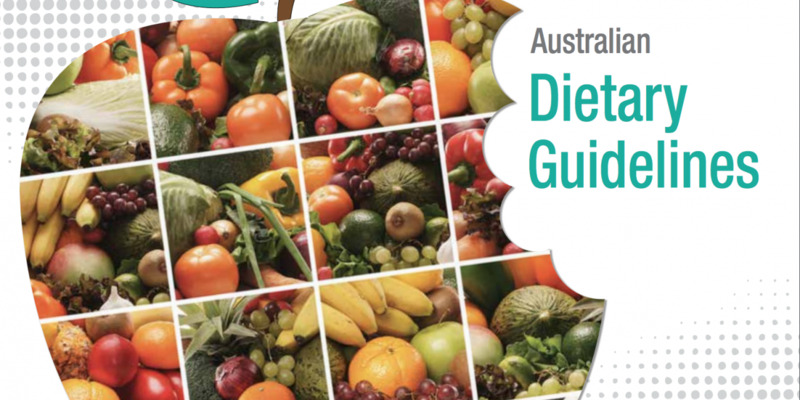 Governments around the world issue ‘Dietary Guidelines’ advising people on what to eat. These dietary guidelines are influential as they underpin health policies. Public health authorities promote them and they form the basis of hospital menus and national feeding programs for school kids and the elderly. In fact, everyone on the frontline of health care is guided by the advice. But new concerns are being raised about the reliability of Australia’s food guidelines, including erroneous health claims and weak scientific evidence. How reliable is the Government’s dietary advice? The Australian Dietary Guidelines (ADGs) claim to be “based on the latest scientific evidence” and are “the best approach to eating for a long and healthy life”. They are published every ten years, the next set are due in 2023. Formulating these guidelines is a huge undertaking. In 2008, the National Health and Medical Research Council (NHMRC) put out a Request for Tender, calling for contractors to conduct a systematic review of the scientific literature, with a view to publishing an update of the dietary guidelines in 2013. The Dietitian’s Association of Australia (DAA) won the contract and was paid $522,221 to complete the task. Under the terms of the NHMRC, successful applicants were required to be free or any perceived or actual conflicts of interest. Did the DAA have a conflict of interest? The NHMRC says it was careful to enforce its conflicts of interest (COI) policy to ensure the successful contractor – the DAA in this case – was ‘independent’ throughout the process. “At the date of entering into the contract, no conflict of interest exists or is likely to arise in the performance of the contractor’s obligations under this contract”, writes the NHMRC. “We can confirm that this policy was adhered to with the successful tenderer, Dietitian’s Association of Australia”. However, several of our investigations have reported on the DAA and its longstanding relationship with the food industry. Critics have been scathing about these relationships, calling into question the DAA’s ability to be impartial as a disseminator of nutrition advice. Although the DAA recently announced it would cease all commercial relationships with the food industry by the year’s end, the agreements have been in place, at least since 2007, the period of time in which the DAA was contracted to the ADGs. When we presented the NHMRC with evidence that the DAA’s relationship with the food industry existed before they won the government’s contract, throughout the review process and continued up until this year, it responded by denying it was a problem. “In the tendering process, DAA identified several potential conflict of interests (COIs) by way of having a number of corporate partners. At the time of tendering, none of these potential COIs were considered to be actual COIs for DAA as an organisation”. Further, the NHMRC wrote: “NHMRC managed these potential COIs for the duration of the contract and continually reassessed whether they presented an actual conflict. This specifically included the requirement that DAA notify NHMRC of any enquiries or communication of any form from its corporate partners related to the systematic literature review commissioned for the update of the Australian Dietary Guidelines”. The NHMRC’s failure to identify the DAA’s food industry funding as a potential or actual conflict of interest has not gone unnoticed. “In my view, the NHMRC has not followed its own protocol. A conflict of interest existed. Therefore, the DAA was not eligible to apply or win the contract”, said Dietitian and Health Economist, Melanie Voevodin. Obtaining an explanation for the decision by the NHMRC was difficult. We sought comment from the Chair of the NHMRC’s Dietary Guidelines Working Group who wrote that they were “not authorised to speak to the media about the details of committee meetings or deliberations”, and referred us to the government. However, the NHMRC later instructed this was inaccurate and in fact referred us back to the Chair (official spokesperson), but to no avail. The NHMRC declined to comment any further saying it “has no further comment on this issue” because it “unreasonably diverts the resources of the NHMRC from its other operations”. Off the back of the NHMRC’s decision to dismiss concerns about a potential breach in its ‘conflict of interest’ policy, some are now questioning the validity of the scientific decisions that underpin the Government’s Eat for Health policy. For example, there are questions about the over-reliance of ‘industry-funded’ studies in the ADGs, upon which dubious health claims are made. “The guidelines suggest three to five serves of grains/cereals every day. But much of that evidence comes from Kellogg’s funded research and other cereal manufacturers”, says Registered Nutritionist, Anthony Power. There are also errors of judgment and citation within the food guidelines. “The reviewers cite a Cochrane review as “excellent” evidence in support of claims that cereal /whole grains reduce the risk of cardiovascular disease”, says Power. “But if you actually read the review, it concludes the opposite”. The results of the Cochrane review clearly states that despite seeing lower cholesterol levels, “None of the studies found reported the effect of wholegrain diets on CHD mortality or CHD events or morbidity”. In addition, the NHMRC promotes the claim that its guidelines are based on the assessment and review of 55,000 scientific papers. However, critics say this is a misleading claim. Furthermore, the most recent publication of the guidelines, which purported to be methodologically robust, failed to review the science behind ‘saturated fat’ on the basis that it was “established evidence”. “Not only does the evidence on saturated fat need review, but the hypothesis on which saturated fat has been demonised should also have been reviewed (the hypothesis LDL causes atherosclerosis), says Voevodin. “Failing to review the research on saturated fats is unscientific, and has done science a disservice”. Another flaw with the guidelines is that they are only supposed to inform dietary decisions for “healthy” people. Yet, Australian GP’s are currently recommending this the ADGs as “optimal management” for people with serious metabolic diseases like type-2 diabetes. “Our food guidelines have become the benchmark for managing chronic disease by default. The fact that people with type-2 diabetes are being recommended the ADGs to manage their disease is a tragedy, especially when the Government itself admits the ADGs are not designed for disease,” says Voevodin. Conflicting messages about what to eat are now commonplace in mainstream media and have led to a crisis of confidence in the health advice from public authorities. Nutrition science is fraught with flawed scientific methodology. The majority of studies that underpin our dietary guidelines arise from “epidemiology” research. These studies often lack scientific rigour because they merely arrive at “correlations” but fall short of proving “causation”. For example, the claim that vegetarians are healthier than meat eaters is based on epidemiological data, which is riddled with confounding variables. It may be that vegetarians smoke less and exercise more which affords them better health, rather than abstaining from eating meat. These sentiments are echoed by Stanford Professor, John Ioannidis in a recent editorial in the Journal of the American Medical Association (JAMA). “Nutritional epidemiology is difficult to reconcile with good scientific principles. The field needs radical reform,” writes Ioannidis. “Nutrition science still largely relies on observational studies. They’re notoriously unreliable due to confounding factors so they need to be largely abandoned” he says. “We’ve wasted enough resources, caused enough confusion and now we need to refocus”. Another flaw in dietary studies is that they often rely heavily on people’s ability to recall what they ate over a period of time as an accurate measure of their food intake – it’s called “memory-based methods of self reporting”. A recent paper in the Journal of Clinical Epidemiology estimated that over a million articles published in the broad area of diet and health since 1946 used memory-based methods. However, the authors were scathing about the reliability of this method of collecting data. “Memory-based methods are pseudoscientific and should not be used to inform public policy or establish the Dietary Guidelines”, said the authors of the paper. “Confusion over ‘what to eat’… is engendered by five decades of deeply flawed, demonstrably misleading, and largely pseudoscientific epidemiological reports based on memory-based (self-reported) dietary assessment methods”, they wrote. There have been repeated calls for government policy on food guidelines to be completely free of industry interference. But what hope is there when our own politicians are seen peddling industry propaganda disguised as science? By the NHMRC’s own admission, the guidelines are based on Level “C” evidence (D is the worst evidence). “And yet, we instruct all health professionals, not to mention the entire population, and set nation-wide public health policy, on this weak evidence, with little consideration to any possible negative health outcomes from these well-meaning public health policies,” says Voevodin. Since the government began assembling experts to assess the evidence behind a healthy diet and the food industry began to infiltrate nutrition science, the population has only become fatter and sicker. While many might argue that people do not even ‘follow’ the Government’s food guidelines, others say that it doesn’t absolve the guidelines from being a failure of policy. “No matter how you dress it up, food based guidelines “instruct” and the current guidelines have driven production and consumption,” says Voevodin, proposing a more radical approach. “Until we get better evidence, lets delete the Australian Dietary Guidelines. The sky will not fall in”. Dr Maryanne Demasi is an investigative medical reporter with a PhD in Rheumatology. You can follow her on Twitter @MaryanneDemasi. Veterinary Science Conference Centre, Webster Lecture Theatre (208) Ross Street / Western Ave Gate Entrance.